Japan has spent a lot of time in the news over the last few months, due to the Tohoku earthquake, the tsunami, and most of all to the leaking nuclear power plant at Fukushima Daiichi. Though I've not read any official statistics, it seems inevitable that tourist numbers this year will be well down on what they were. I counted no more than ten western faces on my flight from Paris to Haneda, whereas previous flights have been fairly evenly split. Be that as it may, the Japanese are a resilient people, and their country is a joy to visit, and the flight prices right now make Japan a real bargain for those who fancy an adventure. It was late morning when we arrived at Tobu Zoo Park. 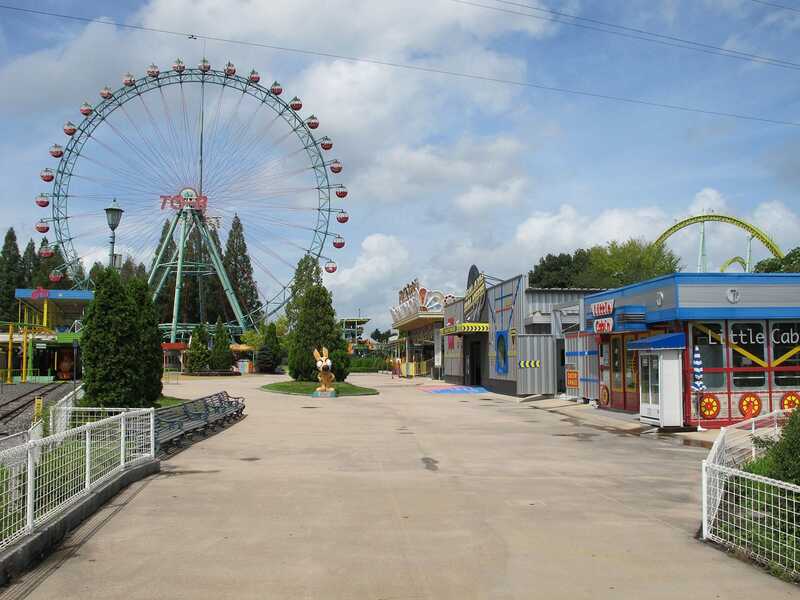 The place was completely deserted, to the point that we wondered whether any of the rides would be open. Fortunately the vast majority were, the only major exceptions being Regina and Tentomushi. Though the latter was no particular loss, it would have been nice to ride the wood coaster again. Perhaps next time. We were almost certainly the first riders of the day on Kawasemi (#1671), an Intamin Mega-Lite and the reason for our visit today. We boarded the train, buckled seat belts, and closed our lap bars, immediately provoking some excited Japanese that indicated that we were not supposed to do that. One of the operators stepped into the control box and released the bars. Then, both took a two-second look at the ride track, gesticulated at each other, and told us to close the bars again. I'm all for making sure there is nobody in the ride area, though I'm a little mystified as to why the lap bars need to be open for this check to take place! Following that, we were given a thirty second spiel in Japanese which was almost certainly a safety announcement before being dispatched. With only two passengers in the train the experience felt quite a bit weaker than what we'd expected, being noticeably less intense than the rides we had on its clone in Denmark last weekend. It would have been nice to ride again with more weight in the train, but we'd probably have had to wait a few days for a full complement. As good as this design is, it wasn't delivering a ¥1000 experience today, so we decided once was enough. We'd planned to visit Yokohama Cosmoworld later this week, but as it was close to our hotel we elected to rearrange the plan on the fly in order to get a lap on Family Banana Coaster (#1672). This coaster was designed by the Japanese for the local market, and as such it is very difficult indeed for tall westerners to fit on board. We did manage it, but I had to sit sideways and even then it was a challenge. There was only one remark to be made on disembarking; ch-ching!